When I set up this blog, I wanted a name to reflect the global connections and collaborations that I hope will drive the blog. I live and work in Japan. The Japanese have several words for connecting – it depends on what is being connected and why. After the earthquake and resulting tsunami of March 2011, a word that has become popular in Japan is kizuna -to bond together or connect people. 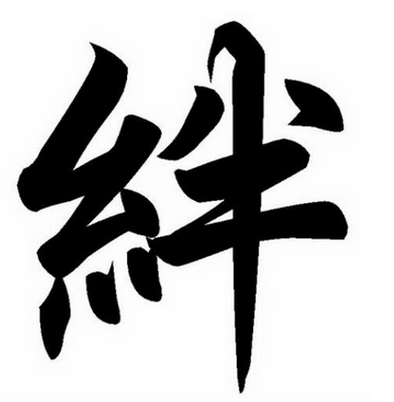 In Japanese, the written kanji of a word often represents a deeper meaning. The kanji for Kizuna consists of two parts. Japanese friends explained their interpretation of the kanji; the first part, meaning rope or thread, shows weaving together or connecting. The second part, meaning half, represents two halves that become stronger when they are connected. After the disastrous events of March 2011, the people of Japan reached out to each other, making connections across the country. Kizuna became a sysmbol of strength through connection. The people of Japan voted for kizuna as the kanji of the year for 2011. As I reflected on this I thought that these are the kind of connections I hope to make through this blog -connections with other people that will be mutually positive and strengthening. Tasha, I really enjoyed exploring your online spaces and places this afternoon. You are a wonderful globally minded educator and I am very excited to have you in this Flat Classroom cohort. Thanks Julie. I am excited by this new learning journey and the opportunities is brings. Lots of new colleagues and ideas already! Hi Tasha. You have a wonderful site that reflects the thoughtfulness and strength of this profession of ours. Remember me, Indra, we taught in Berlin together, many many years ago. I am currently teaching Year 4 at the Dwight School London (previously known as the North London International School.) We have just had a 2 day workshop on using inquiry in reading and writing and we were shown your blog by one of our workshop leaders. What a lovely surprise that was! I’ve had a chance to look at your blog in a bit more detail and it’s great to see all the wonderful stuff you are doing – good on you. Hope you are keeping well. Keep up the good job and do get in touch, I’d love to hear from you. Hey Indra! Great to hear from you! I’ve often wondered what you are up to. Are you on Twitter or FB? What’s the best way to connect? Would love to be in touch again. hi Tash. It might be difficult to believe but I’m not on facebook or twitter. I don’t supppose you still have my hotmail address, do you? married? kids? would love to hear all your news. The last I heard you were in Kiev.